One of the great benefits of working in kitchen and bath design is getting the opportunity to help homeowners see their dream designs transform from a concept to reality. From our first meeting to discuss requirements to completion of the installation, we get to see an idea take shape into a design that enhances our client’s lifestyle. Each design is unique and incorporates the individual requirements, style, and personality of the homeowner. Bathroom design with radiator style towel warmer next to the shower for easy access to warm towels. The bathroom renovation featured here was completed by Lang's Kitchen and Bath in Yardley, PA. We transformed the space from a traditional bathroom with very limited storage space into a beautiful transitional style bathroom design complemented by a sophisticated grey and white color scheme. The new bathroom featured a free-standing bathtub and customized storage solutions designed to meet all the needs of this home, as well as features like the radiator-style towel warmer next to the shower. 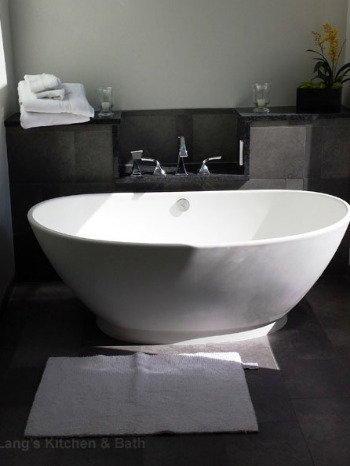 The free-standing bathtub from MTI provides a unique focal point for this bathroom design. The tub is made of engineered solid stone and was installed with bubble jets to provide the ideal soothing retreat from everyday stress. The wall behind the tub is both decorative and specially designed to accommodate and disguise the plumbing. Freestanding tub provides a focal point for this transitional style bathroom design. The bathroom design includes storage solutions for every item you need to have available in your master bathroom. The recessed niches pictured here were included in the shower for easy access to toiletries and next to the toilet as a unique alternative to the traditional toilet roll holder. Niche built into the tile wall in the shower ensure toiletries are close at hand in this bathroom design. Unique niche built in next to the toilet as an alternative to the traditional toilet roll holder. The bathroom vanity from Dura Supreme Cabinetry is both stylish and practical, with plenty of built-in customized storage. Just like your kitchen should include specialized cabinetry and accessories to accommodate all your kitchen supplies, so can your bathroom cabinetry allow for storage designed to hold all your toiletries, electrical items, bath linens, and more. This bathroom design includes plenty of pull-out storage to make it easy to find everything you need, as well as a pull-out laundry hamper to ensure no dirty clothes or towels need to be left on the floor. Dura Supreme Cabinetry is both a stylish and practical addition to this bathroom design. Were you inspired by this design? Visit our design gallery for more exciting bathroom ideas here.